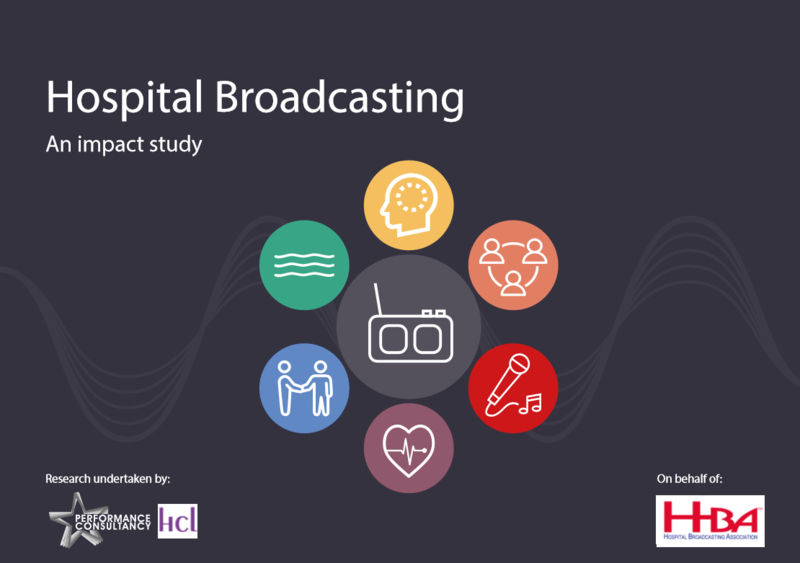 The HBA commissioned an independent piece of research into the impact of hospital broadcasting on health outcomes for patients. A UK wide study was completed involving over 250 individuals including patients, staff and hospital radio volunteers. Participants in the research recognised the positive impact of hospital radio on reducing boredom, loneliness and anxiousness. Moreover, insight from the research revealed that hospital radio was actually positively influencing all of these psychosocial outcome measures. Entertainment is provided by hospital radio through the playing of music, along with other content, that listeners like and that they feel is relevant to them. Social interaction via hospital radio comes from providing listeners with a virtual friend, and through face to face interaction with volunteers from the station. Hospital radio through the approach to broadcasting taken by presenters provides a distraction and is a calming and reassuring form of entertainment. Hospital radio helps create a positive sense of belonging by familiarising patients with the hospital and allowing them to maintain a connection with their lives and people outside. Hospital radio helps people to feel like an individual by focusing on their personality and music preferences. Hospital radio has the potential to increase awareness of health and wellbeing by delivering information and advice in an appropriate and sensitive way. In addition to benefitting patients, hospital radio has a positive impact upon volunteers through making them feel like they are doing something worthwhile and by creating a sense of community and belonging amongst radio station volunteers. There is potential social value generated by hospital radio through the impact it has upon the psychosocial outcomes, and the links between them and both physical health outcomes and organisational priorities for the hospital, such as a positive patient experience. Recommendations are made to increase the impact of hospital radio through raising awareness and promoting partnership working with hospital partners. You can download the report below and the HBA has also made additional member resources available to the Association's member stations.